If you had a hit - really, an icon of the decade - aren't you obligated to come out with a sequel? This time, our evil corporation is augmented with a mad scientist. Well, a scientist more insane than the previous ones that went against all ethical standards to create RoboCop in the first place. The desolate wasteland of Detroit is met with a financial crisis where they find they owe OCP, which I believe stands for Onerous Corporation of Poo-poo-heads, close to $40 million for various corruption, malfeasance, and mismanagement reasons. 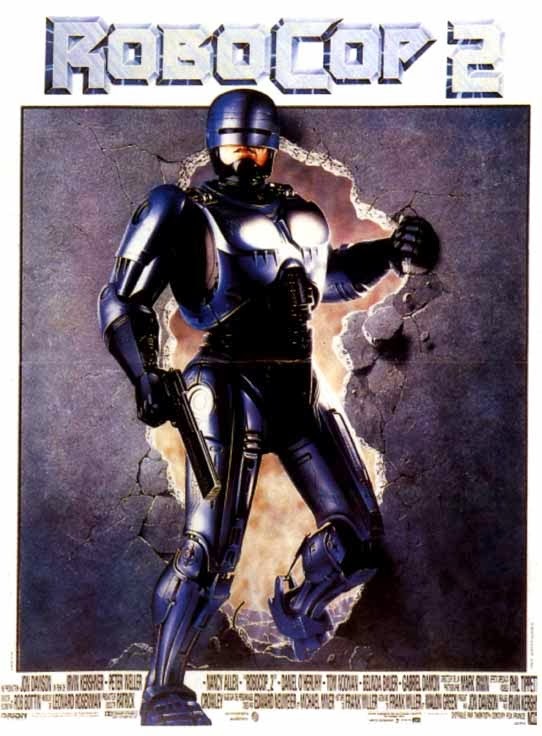 OCP has decided to make more RoboCops (better designed models - not more of the same one that is working just fine) to replace the striking police force that they themselves are managing. And the largest storyline is that of a new drug - Nuke - and the people who produce it. We see the return of Peter Weller as the titular character, and if anything his acting is a bit worse in this film. The RoboCop walking movements are jerky, slow, and angular. When he's walking down the street or through the station, it gives a commanding, war-machine kind of presence that works pretty well, but it doesn't translate to any of the physical scenes where he is required to adjust quickly or move swiftly. There is a disconnect between the minute and rapid movements require to jump on top of a car and hold on and the broad, slow movements that he makes the rest of the time. When he is very, very damaged at one point, the effects guys came up with a fake torso with moving eyes, lips, teeth, and some muscles under the skin. For 1990, this was a damn good effect. All Peter had to do was make some moaning noises, and the sound guys matched it up with the mouth movements. It's still not a bad effect after all this time, but it's no CG. Nancy Allen is back as RoboCop's partner, but she's a side note in this movie. It seems kind of odd to have so many of the original cast people back in the sequel. And so many of them really seemed like they just didn't need to be there. The CEO of OCP, his deputy, the Captain of police, several of the cops, etc. The power female of the group is the insane scientist who foolishly decides that she needs to use the brain of a psychopath to power the next RoboCop. She's also sleeping with the CEO, and that makes for some tense interactions with the official second in command. By today's standards, a scant 23 years later, she's not particularly hot, but she's supposed to be played like she is, which comes off as just a bit too strained. The effects for the other RoboCops is pretty horrible. They use stop-motion animation that is behind the times even for 1990 when this movie came out. It's discordant that this movie would have such good puppet effects for the head and then such bad effects for the big bots. I don't know what to make of it other than that they spent their whole budget on the puppet.